The eighth edition has been somewhat controversial: the prize, which is organized by the Writers Union, is awarded by a jury of 61 people who have to choose from 187 books. The “long” list of 20 titles was strongly criticized as eight of the top 10 books were the works of Presidents or Vice Presidents of the regional unions of the Writers’ Union! The five books chosen should cool down the controversy because the authors are all popular writers (although three of them are President and Vice President of a regional union !). Zhang Wei‘s book (“The Highlands”) is a monster of 4.5 million characters; it took twenty years to write and it was published volume per volume. 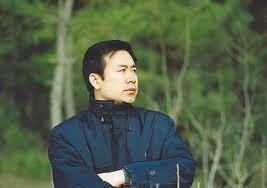 He is a writer from Shandong, who lives in Jilin. Born in 1956, he is not well known abroad, although two of his novels have been published in the United States (“The Old Boat” translated by Howard Goldblatt in 2008 and “The Fable of September”, translated in 2007 by Terence Russell and Shawn Xian Ye). In France, was published by Bleu de Chine a collection of short stories: “Partance” (translated by Chantal Chen-Andro). We are looking forward for the release by Le Seuil of the translation of “The Old Boat,” a great novel by a writer considered as major in China. We will only mention two other winners, two great books: “Frogs” by Mo Yan, and “The Blind” by Bi Feiyu (also known as “Massage”), just published by Philippe Picquier which I am reading with great pleasure. As for Liu Zhenyun, who was already presented, he is the last winner for “A sentence is worth a thousand words,” a book about the isolation of individuals, the difficulties of communicating. The absence of religion is for the author the basic cause. Once again we can see that we are blessed by our publishers with the number of releases, far more numerous than in the Anglophone world.